Also referred to as the Last Wilderness, Kaokoland is largely accessible by four-wheel drive vehicle only. But improvements to the roads have made it a lot easier to explore some parts of this wilderness. Not surprisingly the Epupa Falls are one of Kaokoland’s most popular attractions, and combining them with a visit to Etosha National Park is a great way to enjoy spectacular scenery and wildlife. Although the round-trip from Windhoek can be done in five days if you’re pressed for time, rather schedule eight days to make the most of your journey. Getting to the Epupa Falls from Windhoek is like a walk in the park now, compared to just a little more than a decade ago when travellers had to run the gauntlet of the 260 km stretch of powdery white gravel road between Kamanjab and Opuwo. Nowadays only the last 179 km of the 911 km journey from Windhoek is gravel road. If you want to cover the entire distance to Epupa in one day, you have to leave Windhoek very early to arrive before dark. It is definitely more advisable to stay over along the way. Opuwo, the administrative centre of the Kunene Region, has expanded considerably over the past two decades but has retained the atmosphere of a frontier town. It has become a bustling place with people constantly coming and going, and you are unlikely to escape Ovahimba women in traditional garb trying to sell handcrafted curios without taking ‘no thank you’ for an answer. Opuwo is the last opportunity to buy necessities and refuel before you reach Ruacana, 345 km away. This is also where you leave the tar road behind for the last 179 km of your journey to Epupa. Expect the road to be corrugated for much of the way unless it was recently graded. No matter how many times you have been to the Epupa Falls, the view that awaits you as you crest the final hill is simply stunning. Above the falls, the Kunene River meanders through several channels and around palm-clad islands before tumbling down a 457 metre-long rock shelf in myriads of cascades, chutes and small waterfalls that converge further downstream. Epupa offers a choice of four accommodation establishments. My firm favourite is Epupa Falls Lodge and Campsite which is situated at the very edge of the falls under a swathe of makalani palms. The establishment dates back to 1991 when Koos Verwey, a man with a deep passion for Kaokoland and its people, began building the camp. Whether you simply want to relax or undertake some of the activities on offer, plan to spend at least two full days at Epupa. The lodges offer a variety of activities such as guided tours to Ovahimba villages, sundowner drives and guided hikes while the more adventurous can brave the rapids of the Kunene River. Rafting trips are conducted by Epupa Camp between May and November and although the rapids are usually not too wild it’s a most enjoyable experience. Epupa is one of the best places to see the Rufous-tailed Palm Thrush. The lower Kunene River is the southern-most limit of this bird’s distribution. Gone are the days when the 94 km track (D3700) between Epupa and Swartbooisdrift tested the skills of even the most experienced 4×4 drivers. The main fall at Epupa drops 36 m into a narrow gorge and carries an estimated one third of the Kunene River’s water. Depending on the condition of the road, the journey could take anything between eight and 12 hours in those days. Now it can easily be completed in less than four hours because the track was upgraded in late 2016. During high flood levels, however, it may be impossible to drive this route as low-lying areas may be submerged. As you continue further east the alternating vertical bands of scree and vegetation that characterise the slopes of the appropriately named Zebra Mountains dominate the scenery. These mountains are home to Namibia’s rarest bird species – the Angolan Cave Chat – and mark its southern limit of distribution. In Namibia this species was recorded for the first time only in May 2010. On reaching Swartbooisdrift, make the short detour to the Dorslandtrek memorial – a reminder of the unbearable hardship these headstrong trekkers endured. It commemorates the return of about 2,000 Dorslandtrekkers from southern Angola in 1928 and 1929 to what was then South West Africa. Just 4 km beyond the turnoff to the memorial you arrive at Kunene River Lodge – a lush haven of peace and tranquillity. The lodge offers a variety of activities including half-day white water rafting excursions which start at Ondoruso Gorge. Along this section of the river there are some exciting rapids that will get your adrenaline pumping. Kunene River Lodge is also a popular base for birders in search of elusive species such as the Angola Cave Chat, Grey Kestrel, Bare-cheeked Babbler, Cinderella Waxbill and the Rufous-tailed Palm Thrush. Birding walks and excursions to the Zebra Mountains, visits to local Ovahimba settlements, sunset cruises and birding river cruises in the morning are among the activities on offer. Again, you should plan to spend two full days to make the most of your stay. An early start is advisable if Okaukuejo, some 420 km away, is your next destination. If you’re heading for Olifantsrus campsite you won’t be so pushed for time. From the lodge the D3700 continues east along the Kunene River for about 48 km before you can breathe a sigh of relief when you hit tar again. A detour to Ruacana Falls is hardly worth it when the level of the river is low as the falls are usually dry. The falls are a spectacular sight, however, when the Kunene River is in full flood and the water thunders into a 120 metre-deep gorge over the entire width of the river. Refuel in the town of Ruacana (the next filling station is at Okaukuejo – just over 400 km away) and head south on the C35 for 220 km to reach Galton Gate, named after 19th century British explorer Sir Francis Galton. He and fellow explorer Charles Andersson were the first Europeans to reach Etosha in May 1851. From Galton Gate it is 67 km through dolomite hills to Olifantsrus. 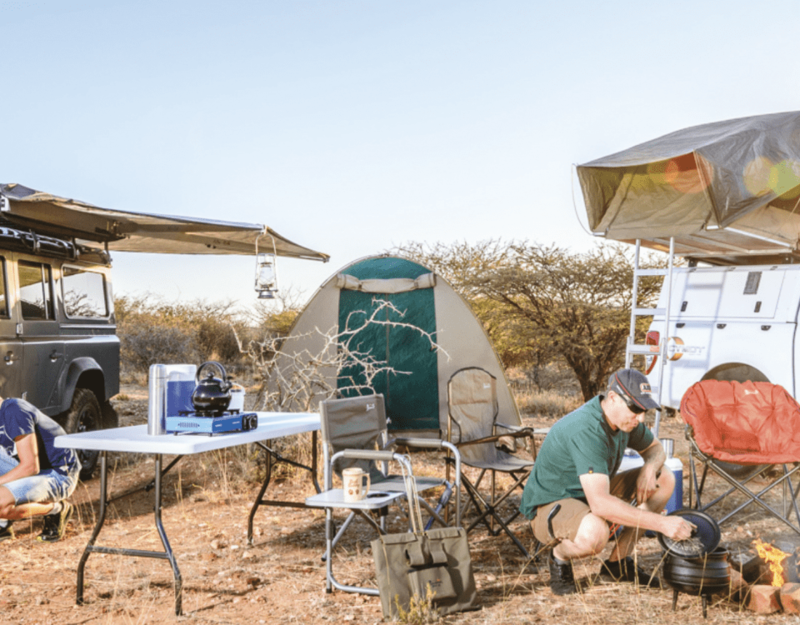 The campsite, run by Namibia Wildlife Resorts (NWR), is an ideal base to explore western Etosha which was opened to self-drive tourists in early 2014. Olifantsrus has camping facilities only. Amenities include communal ablutions, a communal kitchen, a kiosk and a small but interesting information centre. The double-storey, split level hide at the waterhole offers close-up views of elephants, antelopes and zebras coming to quench their thirst and is undoubtedly the camp’s highlight. Originally named after the elephants that frequented the waterhole, the name Olifantsrus (“elephant resting place”) took on a more sinister meaning in the early 1980s. The hoists behind the reception office bear silent testimony to the culled elephants that were processed in the open-air abattoir in 1983, an operation necessitated by a severe drought. The carcasses of 525 elephant, 465 gemsbok and 622 springbok culled in western Etosha were processed at Olifantsrus. A short way behind Olifantsrus the road turns easterly to follow the 19de Breedtegraad road which runs just north of and parallel to the 19th Latitude. Several boreholes were drilled at 10 km intervals along this road in the second half of the 1950s to lure elephants deep into the park which were roaming farms adjoining Etosha. As you continue your journey to Okaukuejo there are several waterholes worth stopping at to see whether there is any activity. The drive is likely to take at least three hours – or more, depending on how busy the waterholes are and what you might see along the way. The Phantom Forest, or Sprokieswoud, is about 40 km west of Okaukuejo. It owes its name to the stunted and contorted stems and branches of the Moringa trees, caused by browsing elephant, giraffe and gemsbok. If you plan to take a detour to Okondeka, famous for its lion pride, you should allow for even more time. Okaukuejo’s floodlit waterhole is internationally renowned for its almost never-ending parade of animals. The resort, managed by NWR, offers a variety of accommodation options ranging from chalets and double rooms to campsites for those who prefer to sleep under the stars. It is also an ideal base from where you can explore the many nearby waterholes. Feeling adventurous? Spend an afternoon rafting on the Kunene River. Lions idylly watch an elephant pass in Etosha near Okondeka waterhole. Stock up on hand-crafted Himba jewellery at the market at Epupa Falls. This article was first published in the Autumn 2019 issue of Travel News Namibia.